The main unionist parties may be planning for serious disturbances in north Belfast next weekend after the Parades Commission rerouted a hugely contentious anti-Catholic march away from nationalist estates in north Belfast. The decision to restrict the Orange Order ‘Twelfth’ parade on the Crumlin Road had been widely expected after local talks failed to reach agreement on the parade. But it drew a surprisingly vehement and collective response from a broad range of unionist parties and the loyalist paramilitary organisations. The DUP, Ulster Unionists, Jim Allister’s extreme Traditional Unionist Voice (TUV), and the political representatives of the UDA and UVF, issued a joint statement, apparently prepared in advance, in response to the Parades Commission’s decision. The parties said it showed that “the commission members place no value on a relationship with unionism and have treated our advice with contempt”. Less than a day after a new multi-party talks process had begun, they announced they would be pulling out. They also said they would no longer co-operate with the Parades Commission and called for peaceful protests -- but their warning that there would be a “graduated response” to the decision was seen as indicating the possibility of violence. The Commission issued one of the most detailed determinations in its history in relation to the application by three Orange lodges seeking to pass Ardoyne on the evening of July 12th. The determination noted that dialogue had taken place between residents and the Orange Order but that had collapsed in April without a resolution, and a single meeting held in June “resulted in no further progress”. One of the main reasons given for refusing the application was the disorder of last July and the nightly loyalist interface intimidation at ‘Camp Twaddell’. The commission noted it had “impacted on community life and community relations” in the area. 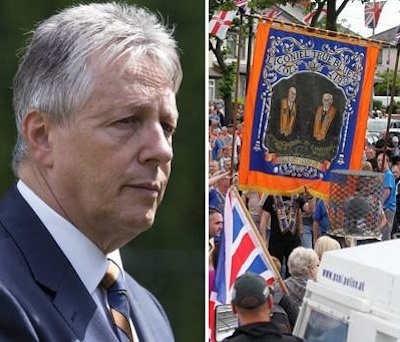 But the DUP leader Peter Robinson claimed the Parades Commission had acted under duress from republicans. “The institutions have been put under threat by the behaviour of the Parades Commission and those who threaten the Parades Commission,” he said. Martin McGuiness accused the DUP of being swayed by its own hardline elements and by pressure from the unionist paramilitary UVF. The return Orange Order march past Ardoyne shops is one of hundreds on ‘the Twelfth’ which commemorate the 17th century Battle of the Boyne. North Belfast has been the scene for the most serious riots of recent years, replacing Portadown as the most associated with marching season violence. Although research this week showed that the number of parades organised by unionists in the north has more than doubled over the past eight years, the number of parades which result in violence has actually declined, a pattern which has continued so far this year. A tense situation in Portadown last weekend was defused when an attempt by loyalists to hold a banned parade at the lower Garvaghy Road was called off at the last minute. And on Tuesday evening, a ‘mini Twelfth’ parade through east Belfast took place without major violence after the PSNI set up a mobile steel cordon around part of the nationalist Short Strand, blocking off nationalist homes. But the situation on the ground in Ardoyne now threatens a rerun of last year, when several nights of intense loyalist rioting took place. Nationalist residents in Ardoyne said that members of the Orange Order and their supporters had failed to respond to a plan by Catholic and Protestant church leaders to hold talks on Monday. And the Greater Ardoyne Residents Collective (GARC) said it was still willing to meet with the lodges to discuss the marching standoff. In a letter delivered to the orders involved in the dispute, it said that they do not wish to hinder the Protestant religion, culture and heritage. But the increasingly hardline approach by the unionist leadership on issues of parades, flags and the past, has scuppered the multi-party talks. While there had been little expectation of progress after the failed Haass/O’Sullivan discussions last December, the two main unionist parties also significantly cancelled Friday’s meeting of the North-South Ministerial Council, a cross-border body set up under the 1998 Good Friday peace deal. Sinn Fein leader Gerry Adams urged the Dublin and London governments “not to acquiesce” to the increasingly overt unionist threats against the political institutions. He said the unionist walk out on the talks pointed to a deteriorating situation in the political process “which has been going on for some time”.